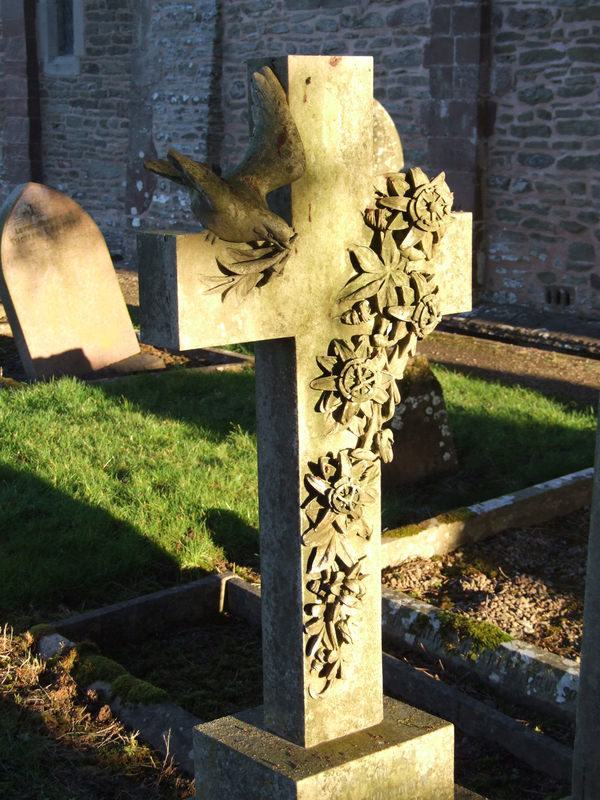 A study of the epitaphs on the gravestones in the church can reveal a good deal about the thoughts and life-styles of some ancestors. There are some splendid stones here, the earliest dated 1696. Many of them are the work of son and father Parry who lived here in the early part of the nineteenth century. Joseph Parry, who died in 1846, lived at Marlas and Richard Parry, who died in 1876, lived at Grafton Oak; both are buried here. There are few memorials inside the church; the large one immediately in front of the altar recalls the Sayce family – sayce/saise is a slightly derogatory name for an Englishman! 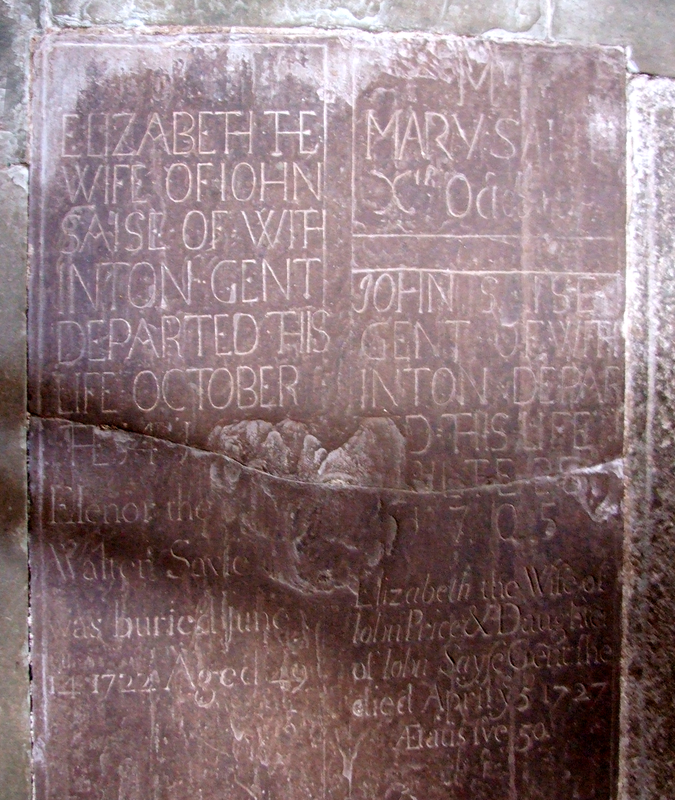 There are two memorials on the south wall of the chancel to the Gomond family who lived at Dippersmoor, one dated 1683 and 1688. The other nearby also carries the date of 1863. Was the Thomas Gomond of the first brother to William Henry Gomond of the other? There are – surprisingly – no memorials to the Lords who lived here, and just one to members of the Pye family, Mary Pye in 1789 aged 82, and husband Edward Pye aged 81 in 1797. In general the churchyard epitaphs follow the deep religious certainty of the times: an acceptance of death and of eternal life. Many might be regarded as sermons in stone, giving warning to all with eyes to see how short and uncertain is the time given to any of us here on earth. Then I did death obey. And he will give you peace. And there for ever dwell. The Lord was pleased on me to call. For God has claimed what he has lent. Called home by early doom. Yet mourner there is comfort in thy loss. Who look to him who died upon the cross. To ease me of my pain. And much affliction have I seen. My latter days were spent in pain. To take me to eternal rest. A great preponderance of the 19th Century epitaphs took the opportunity of doing a little preaching, and many carried warnings to the passer by. Each dying within the space of 24 hours, were buried together and had one burial and committal service. It is the first stone on the right as you enter from the gate. The words are taken from 2Samuel 1, verse 23. And in death they were not divided. My faithful partner from my side. Death - Judgment - Hell - Heaven. Will seem as short as mine. Is there not an appointed time for man upon earth ? Are not his days like the days of an hireling ? And now a few lovely tributes to the departed. with all the ornaments of virtue drest. Who smile in death and triumph o’er the grave. A faithful friend to whosoever. And, to finish with, an epitaph that has become a local legend. A curse over the grave of a young woman. 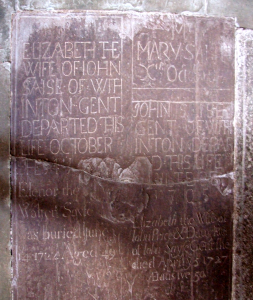 This young woman died in childbirth after being jilted by her lover, a young farmer of the parish. It was usual rather than otherwise for the first child of a family to be conceived, if not born, out of wedlock. Among a prospective wife’s attributes, her ability to bear children was essential; a large family of boys would be needed to help work the farm. It was however a different matter when for any reason the young man failed to stand up to his responsibilities. A very aggrieved family put up this epitaph on her gravestone. Local people used to swear that the curse worked, not only in the first case but also down the generations. A direct descendent of the offending swain, known personally to me, was certainly one of the most miserable men of my acquaintance. Note: Most of this article is taken from a document penned by Norris Meadmore, churchwarden for many years, a farmer, respected benefactor and generous donor to church and village. The full text may be found in the compendium at the back of the church. 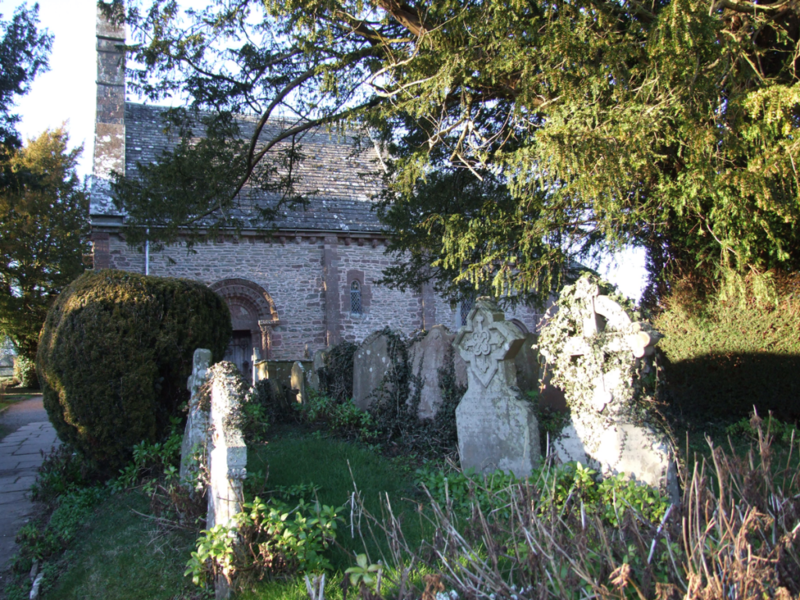 In 2007/08 under Angela Golding the Herefordshire Family History Society recorded the monuments, mostly up to 31.12.1949, though some later dates are also included, 18 inside and 223 outside. The church holds a copy and there is one in the Hereford Records Office.